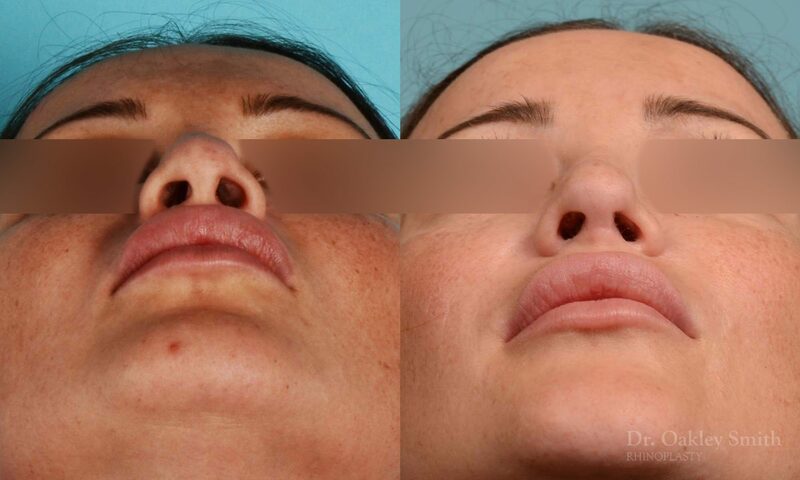 This happy pleasant patient had unfortunately undergone three previous rhinoplasty surgeries. She had broken her nose as a child. 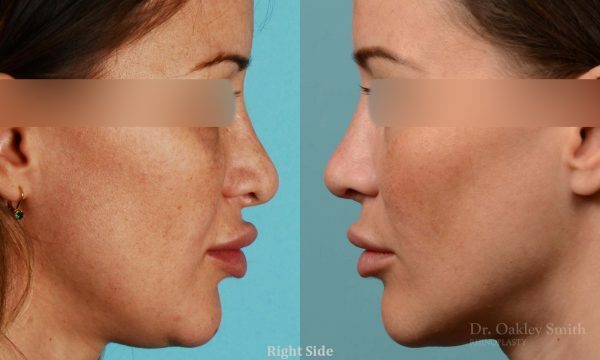 The first rhinoplasty had helped her poor breathing, but the aesthetic results were poor. Several times she had tissue fillers injected to try to improve the residual depressions of her nose. She realized the potential improvements at this stage were less than before her numerous surgeries. She knew every surgery unfortunately reduces the success rate and limits the goals of any subsequent surgery. Her surgery required harvesting rib cartilage as clearly too much of her nasal cartilage had been removed over time. 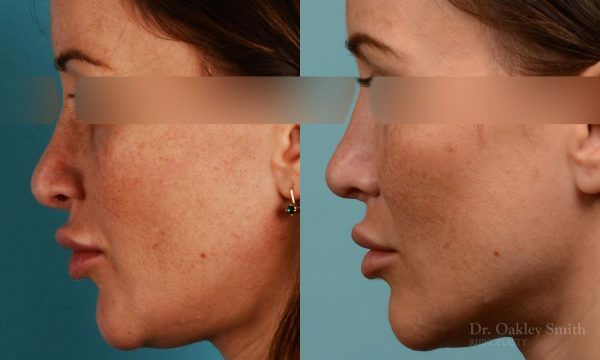 This was part of the reason her nose had lost definition and appeared rounded and without shape. 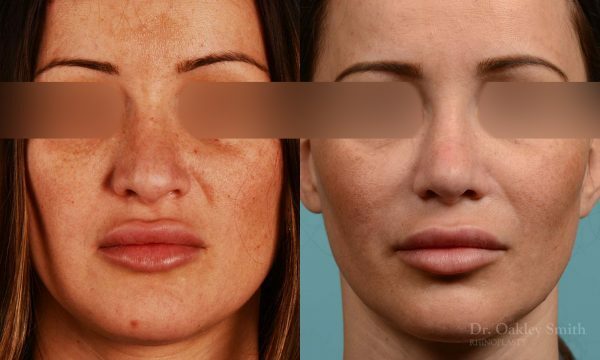 She had also built up scar tissue under the skin from the repeated surgeries, again contributing to the loss of definition. At the time of this surgery, it became clear there was too little cartilage remaining. What was left was too narrow to support her nose and was no longer continuous but had been severed into sections contributing to the weakening of her nose. Her natural tip cartilages were removed and replaced with carefully sculpted rib cartilage. A graft was placed at her tip to create definition. Because so much surgery needed to be done, the degree of surgical control of the outcome is reduced. In her case, this resulted in undergoing a second surgery a year later to re-position the cartilages which had shifted and to again remove excess scaring under her skin. Scaring had re-developed after it had been removed at the first surgery. Several courses of injections were needed to reduce further scaring build-up after her second surgery with Dr. Oakley Smith. 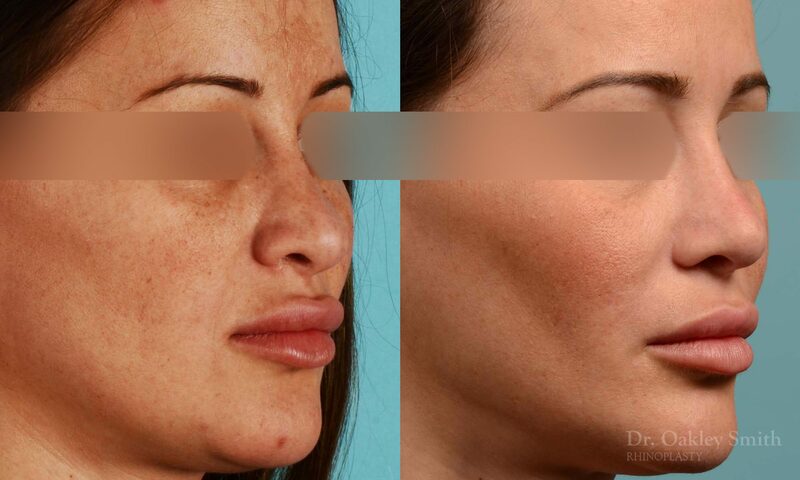 Here is a good example of a very complex revision rhinoplasty. 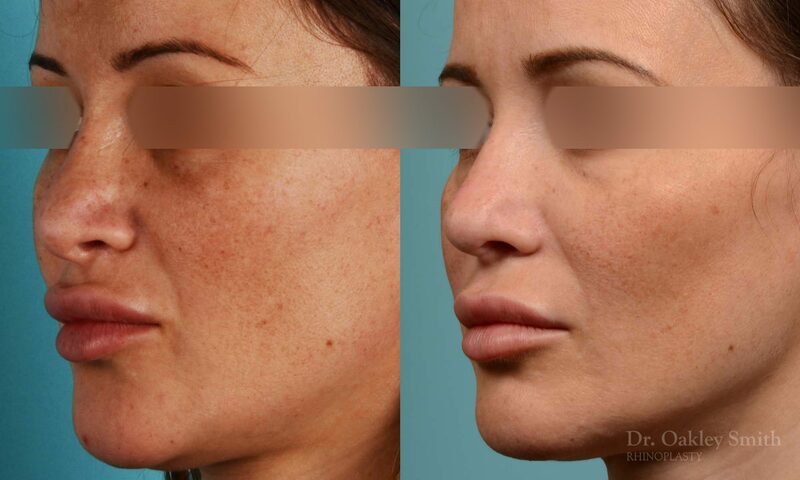 Rhinoplasty is difficult and revision rhinoplasty is even more difficult because of poor damaged tissues, reduced surgical control of outcomes, altered and often delayed healing and the usual need for multiple grafts.